If you are wondering why I’ve been a little quiet lately, it’s because we’ve been busy cutting test plots and gathering harvest data. After long days in this horrendous heat, it’s hard to find a desire to sit at a computer and write. This morning it was so dark outside that I tried to fool myself into think it was a nice, cold winter storm – no such luck. I’ll wait until all the numbers are in to make any comments about the effect of treatments on yields. In the meantime, I thought you might like to see some equipment in action. The best part of harvest is that it really is a gathering of friends. 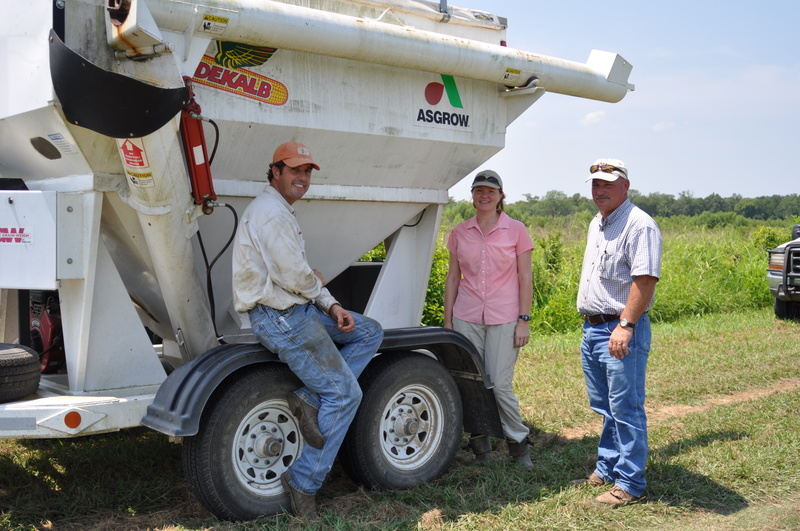 Dean Reed (Helena), Sunny Bottoms (HorizonAg) and Vince Deshotel (LSU AgCenter) waiting in the shade near the weigh wagon. Charlie was busy trimming the edges so we could cut our passes. The first step is to trim the edges of the field so that we are harvesting from a measurable area and can calculate accurate yields. Combine in the background is trimming the edges, and in the direct line of the camera you can see that the front edge has been trimmed to make a clean starting line for the pass. The second step is to run a pass up the treated area. The combine is about to finish the first pass in the untreated area. 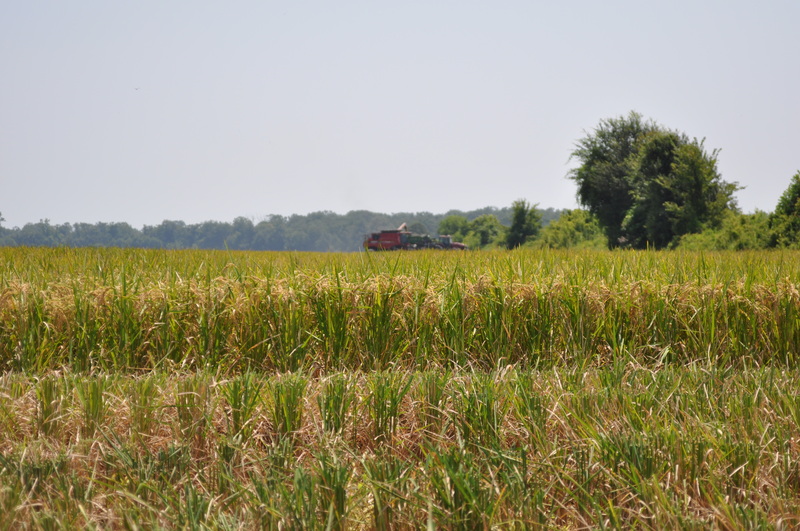 Along the way, the header is cutting the head (panicle) off the rice plant and separating the hull (containing the grain) from the straw. 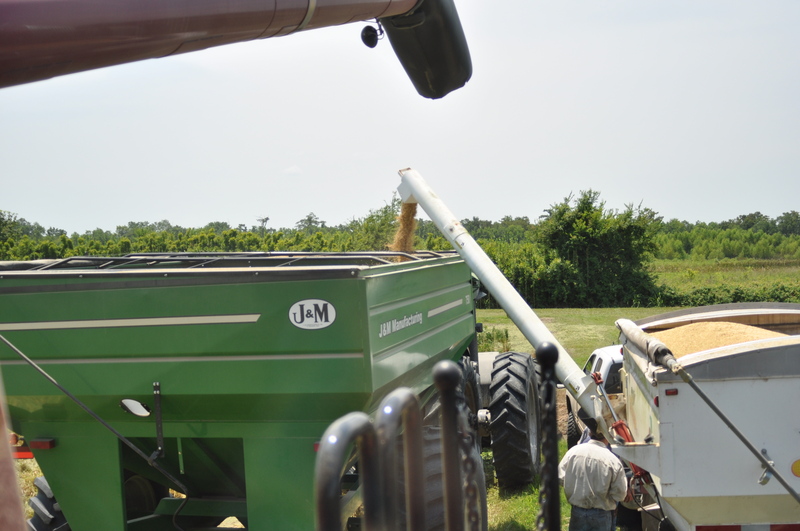 The grains are collected in the hopper and the straw is ejected out the back of the combine. 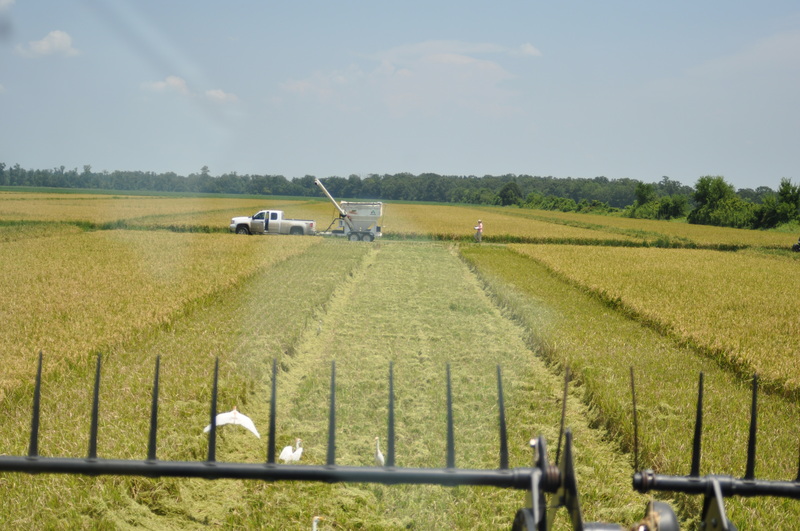 Rice panicle and straw being cut and pulled into the combine - there is a rotating pair of belts that moves the grain and stalk into the combine for sorting. 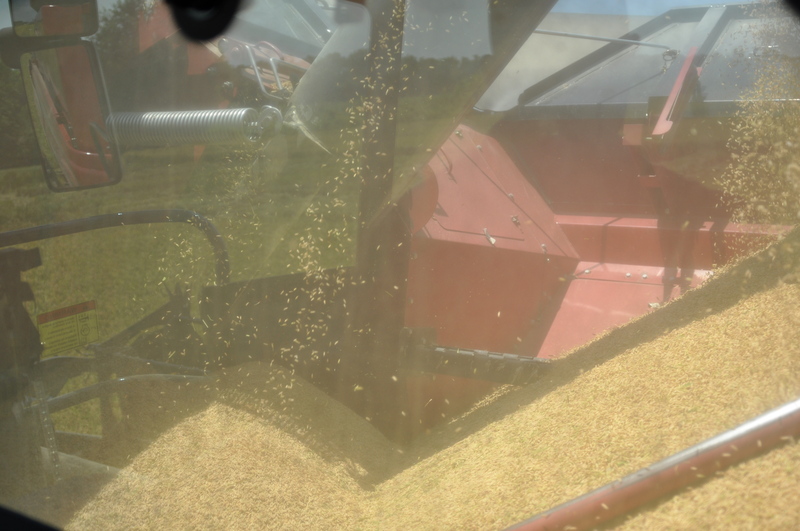 Rice entering the combine hopper - sorry some of these pictures are dusty, but this is dirty work! 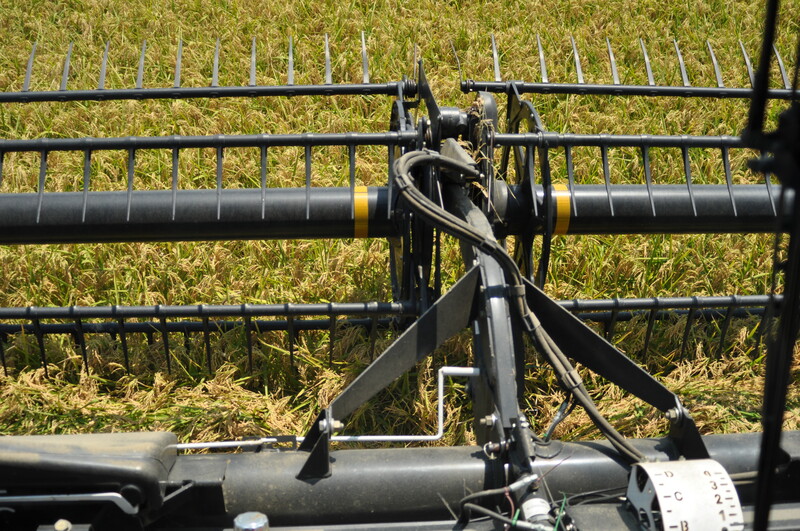 After the pass is completed, the rice is transferred from the combine into the weigh wagon. 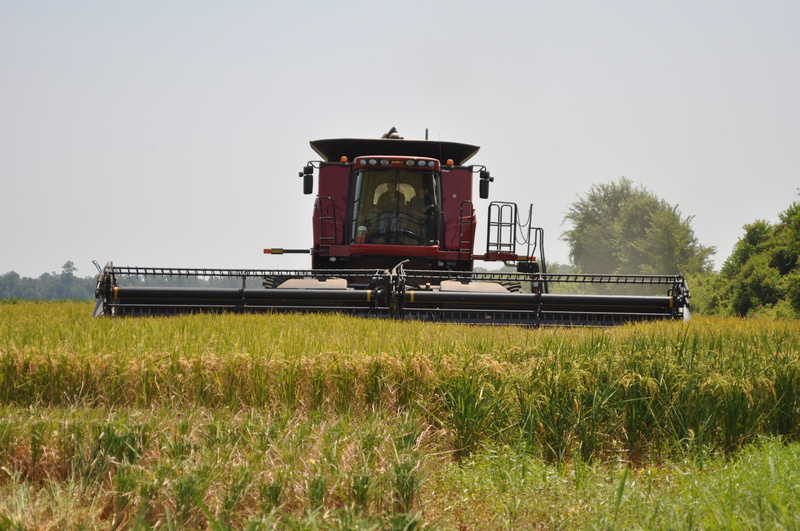 Combine lined up with the weigh wagon to empty the rice out of the hopper and calculate the yield. The weight, grain moisture, and temperature of grain are recorded. Then the contents of the weigh wagon are emptied into a grain cart to get ready for the next round. The rice is emptied from the weigh wagon into the grain cart. In the meantime, someone else has the physical job (which was tough in that extreme heat yesterday) of measuring the length of the harvested area. This is measured with a wheel. Dean Reed was walking the wheel in this picture. This process is repeated until you complete the harvest. Birds are often attracted to the combine and are real daredevils as they dive and dodge for grasshoppers, frogs and other critters. 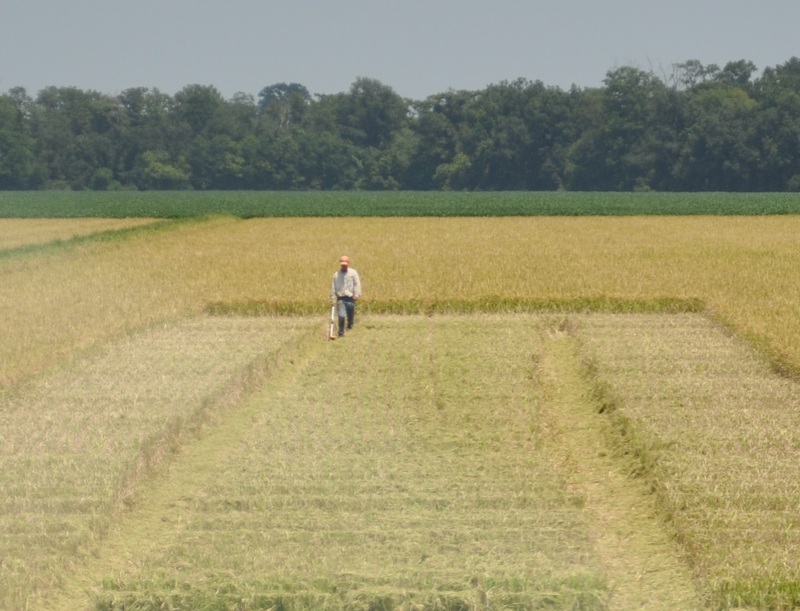 Rice and soybean farmer Charlie Fontenot anticipates that he will be harvesting for more than 20 days straight to get all the rice cut and then roll into soybean harvest. We thank him for participating in this variety trial and demonstration test. 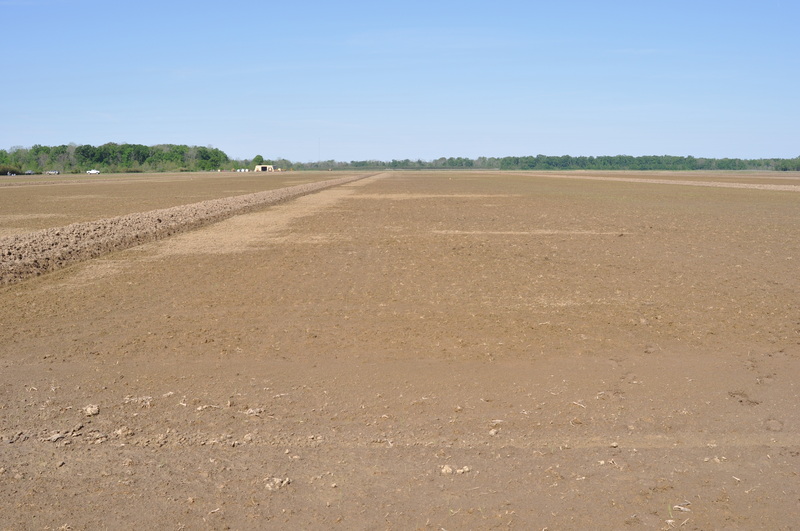 The rice we harvested will be fertilized and flooded up for second crop. 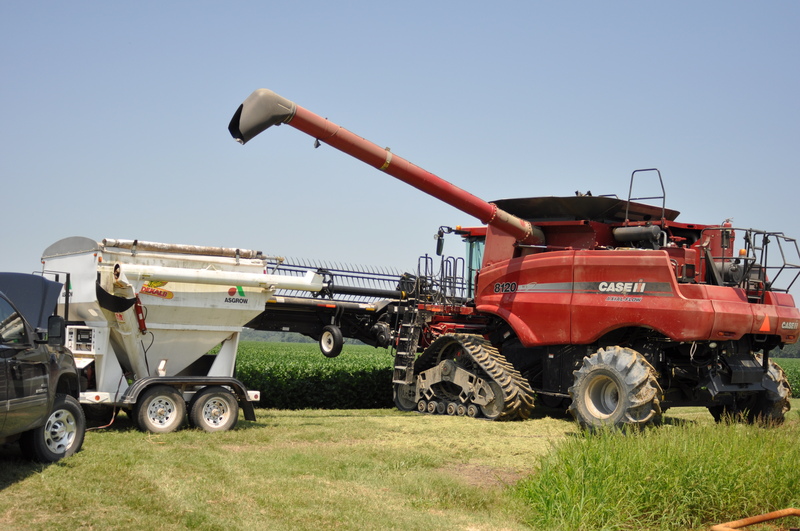 Charlie Fontenot operating his Case combine. 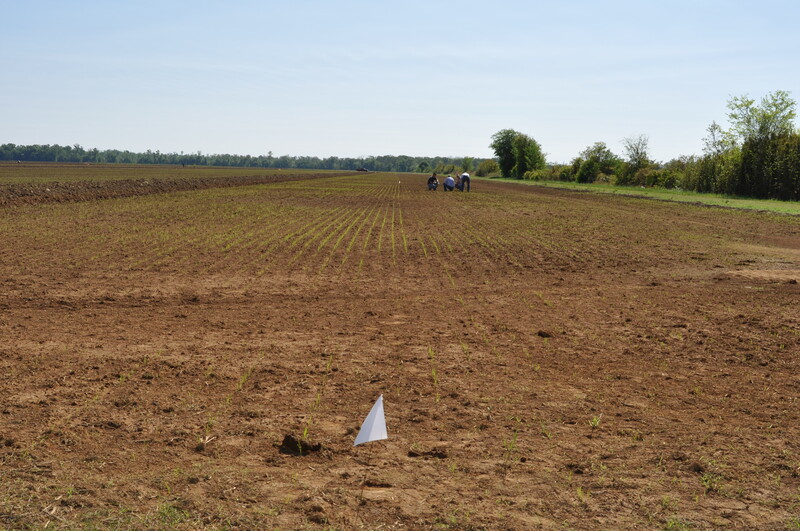 Today we met with cooperators in St. Landry to look at the differences in stand emergence between the insecticide treated (Dermacor X-100, CruiserMaxx) and non-insecticide treated seed (fungicide only). 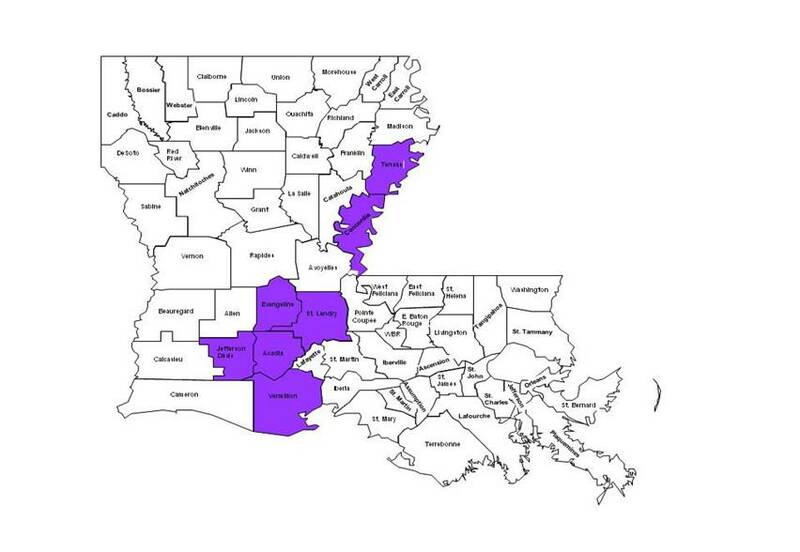 This location is a joint effort between LSU AgCenter, Horizon Ag, DuPont and Syngenta. We are evaluating CL151 planted at a variety of seeding rates (#40, #55, #65, #70, #85, #100). Dermacor X-100 treated seed to left of flag, untreated seed (fungicide only) to right of flag. There was no noticeable difference between the Dermacor X-100 and CruiserMaxx treated seed. These were both planted at 65 lbs per acre. Dermacor X-100 treated seed to the left of flag, CruiserMaxx treated seed to the right. No visible difference in stand at this time. CruiserMaxx is applied at 3.3 fl oz/100 lbs seed, regardless of seeding rate. 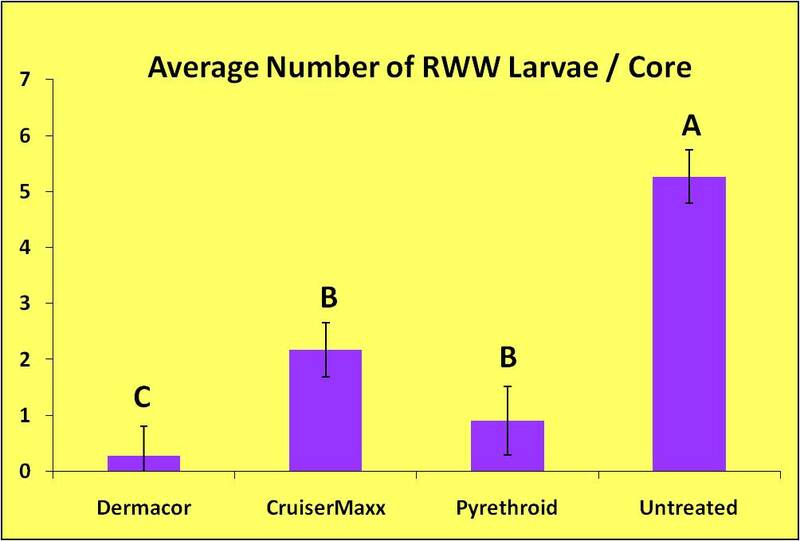 One of the objectives of this test is to confirm that CruiserMaxx provides the same level of rww control at low and high seeding rates. 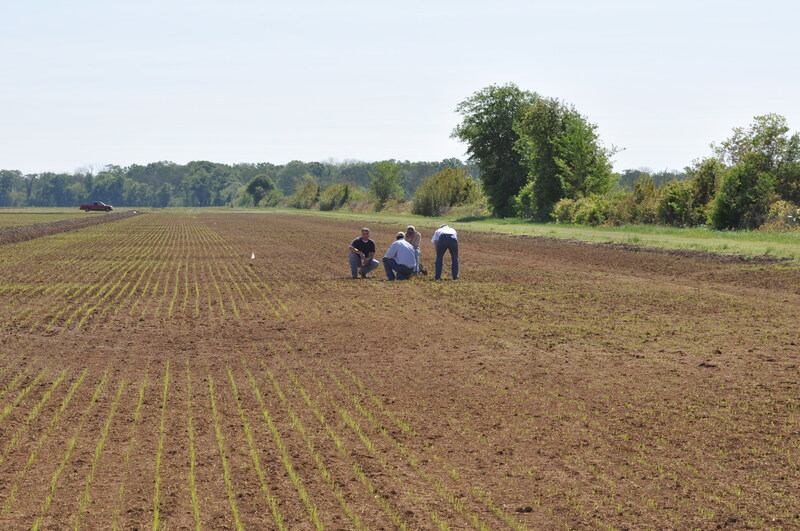 The seeding rates that we are evaluating include the following: 40, #55, #65, #70, #85, #100. At this point, there is no real visible difference in stand, except when comparing the high (#100) to low (#40). 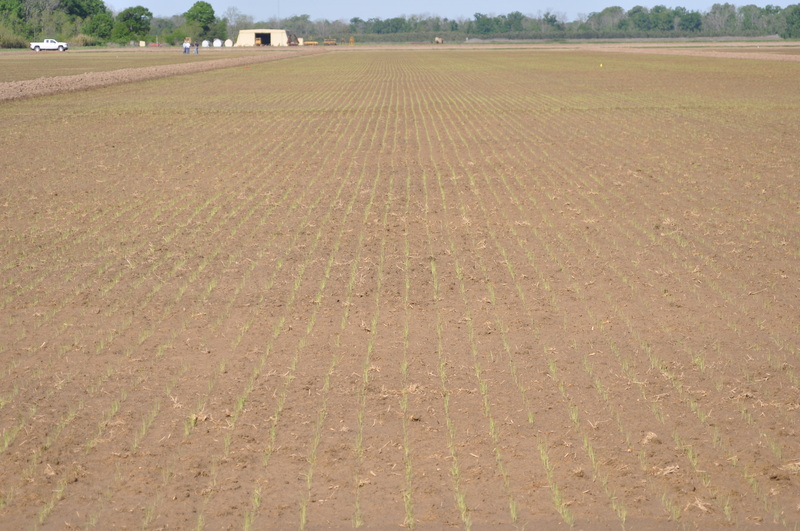 CruiserMaxx treated CL151 - plants are just beginning to emerge from the ground. Planted at 40 lbs/acre. CruiserMaxx treated CL151 seed planted at 100 lbs/acre. We dug around in the untreated area for a little while to see if we could find colaspis larvae feeding on the roots. We did not find any today. We’ll return to take stand counts in about two weeks. 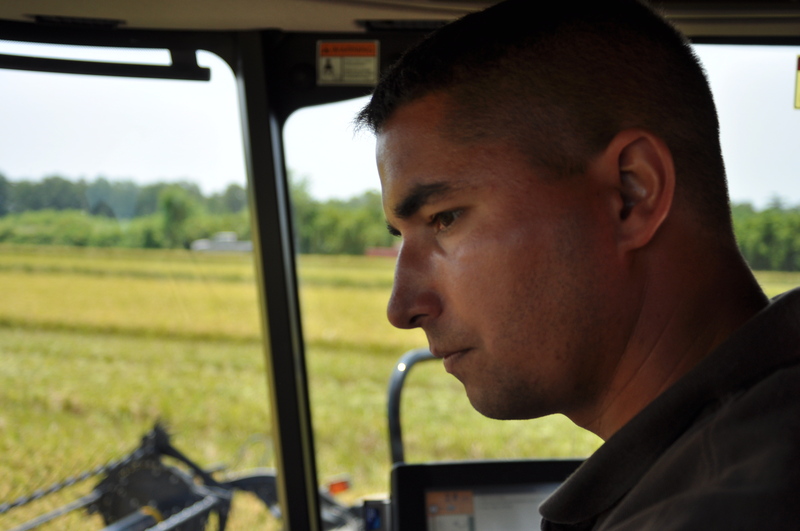 These first few weeks of the test are critical for detecting colapsis damage, if it occurs. Scouting for colaspis in untreated check area. 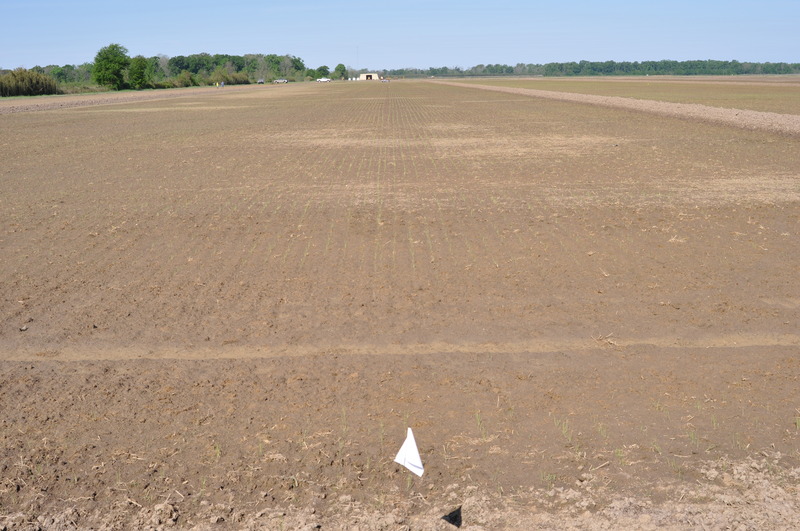 In the above picture, Dermacor X-100 treated seed is to the LEFT of the white flag. Untreated area is to the right of the flag.